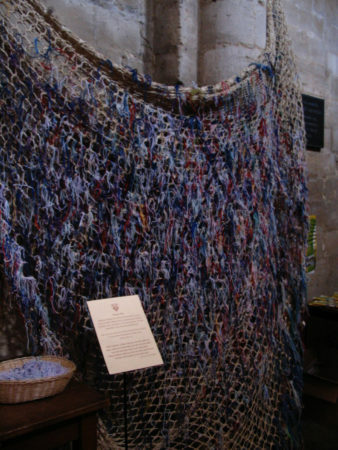 "A piece of yarn tied to this net expresses the prayer of your heart without speaking a word. 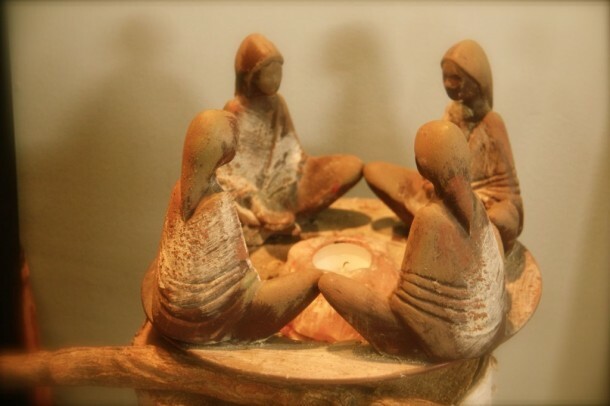 By rituals like this, we come closer to the Holy Spirit who prays within us 'with sighs too deep for words.'" A few years ago, the choir from our church made a pilgrimage of English cathedrals, including the great Ely Cathedral. There, a wonderful public prayer forum in the form of a fishing net caught the eye of one of the singers, Marsha Kimura. "When the Cathedral was built Ely was an island, in a sea of rivers & swamps. Fishing formed an important part of people's livelihood. Jesus' first followers were also fishermen. 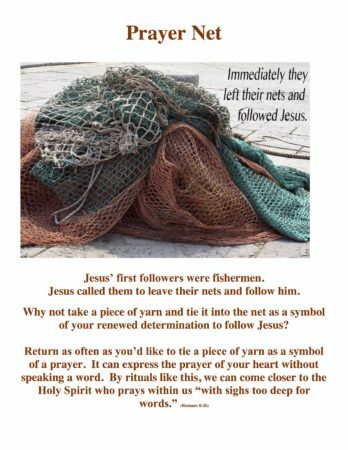 Yet Jesus called them to leave their nets and follow him." 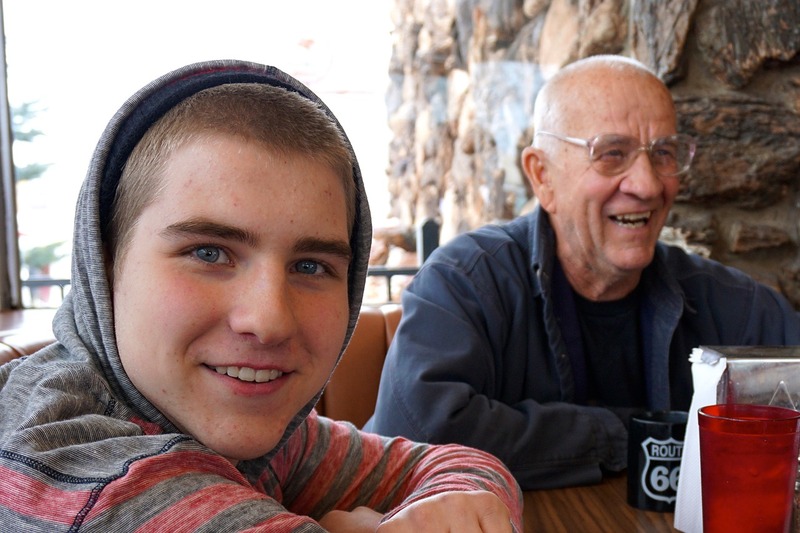 Marsha came back to San Antonio, shared her photo and her experience with the prayer net. I immediately loved the idea, too! I wanted to adapt it for our 4th to 6th grade Sunday School room. 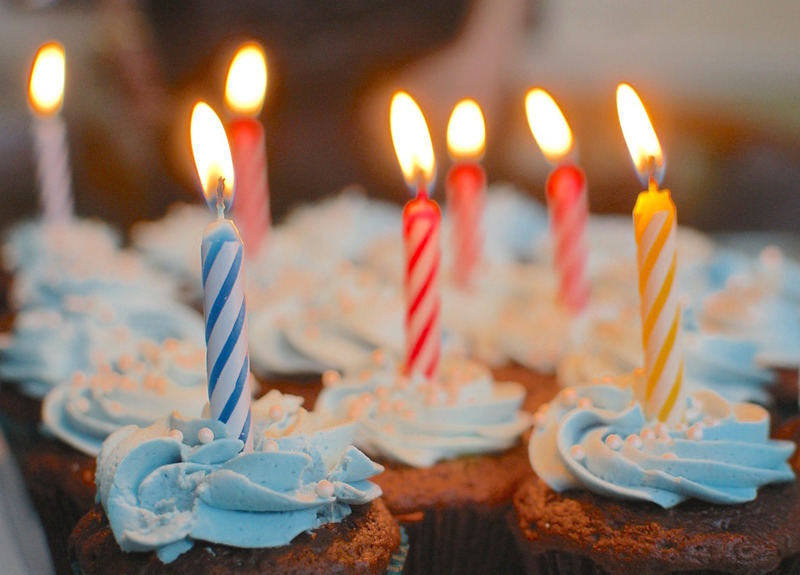 I especially liked the idea for that age group, who might not always have the words they want to use in their prayers, but often feel strongly about what is going on in their lives. 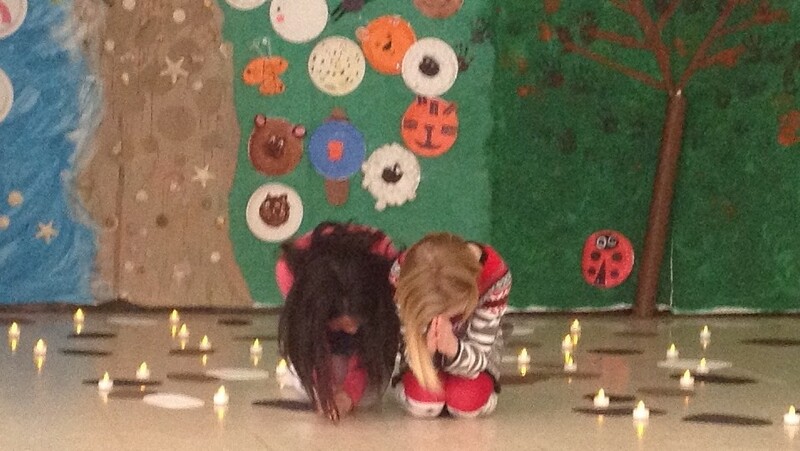 I wanted my older elementary kids to know that their prayers were joined with others. I wanted them to know that they could take part in praying in an outward and visible way because Jesus has called them, as he called his fishermen followers and as he calls all of us. The teachers and I promise our young people that we add their prayers to our prayers when we pray for the Sunday School. Even if we don't know what their prayer-intention was, we pray from them to be followers of Jesus, fishers of people, and ask God's blessing on their prayers. Recently, one of our priests came to the class to talk about prayer. 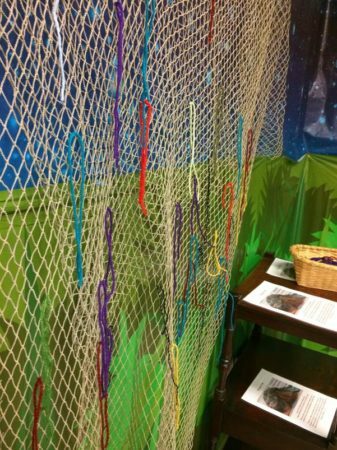 As he tied on his own prayer to our prayer net, I could almost see the students' nodding in agreement: we all pray, we all ask for God's blessing, we all follow Jesus' call. Preparing for our prayer net was easy. 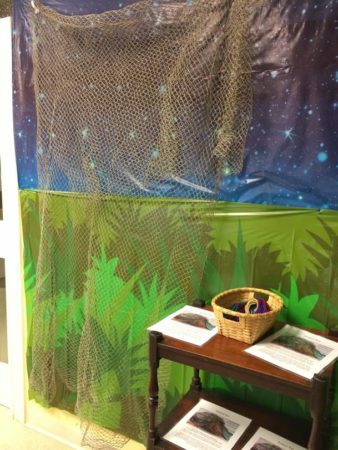 In a corner of our room I hung a net that had holes large enough for tying on pieces of yarn. 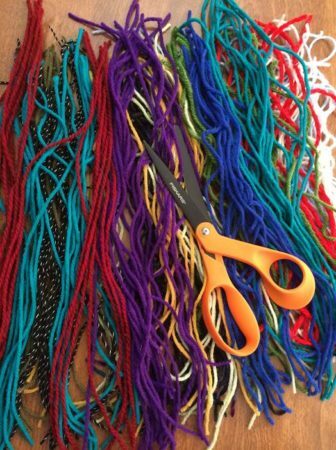 I cut lengths of yarn and printed out an explanation written with my upper elementary students in mind. 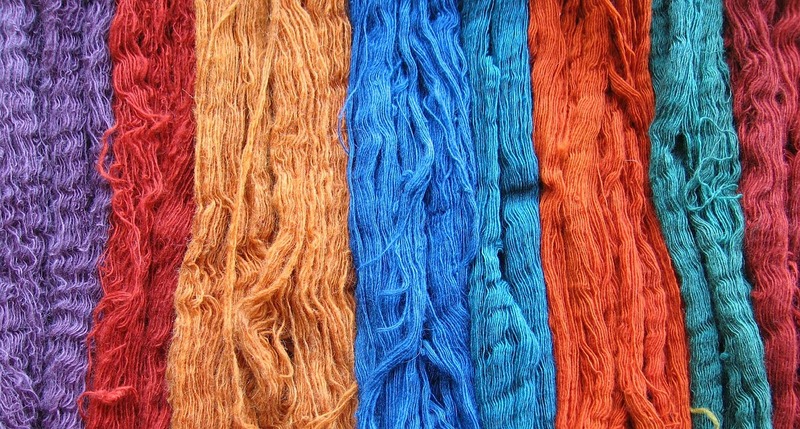 Yarn and printed explanation sit next to the net on a small table. I would recommend this tactile approach to prayer. It was inexpensive and can be organized for a variety of applications: short periods of time, such as a retreat day, or for a unit, or a year, or as a permanent form of pilgrimage, as it is at Ely. 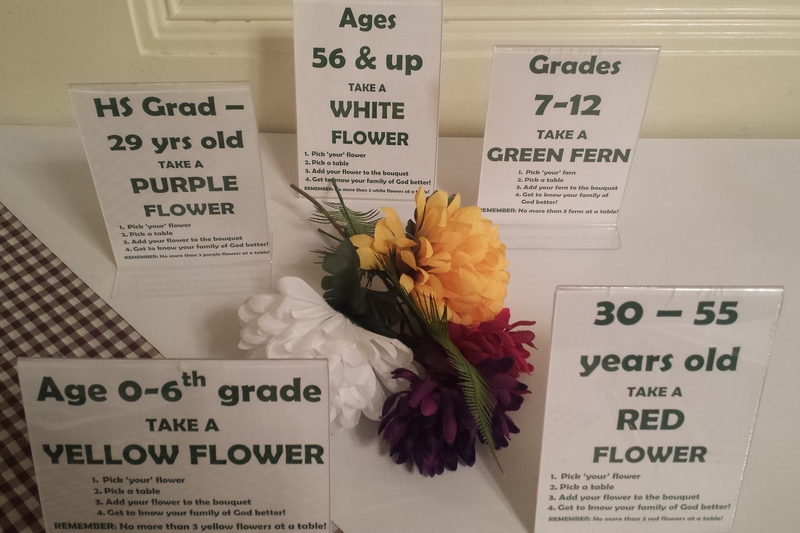 The adults who have shared the action of tying on a prayer seem to appreciate it as much as our young people. Gail Jackins grew up in Northern Maine, so her friends refer to her as a Mainiac. She has a B.S. from the University of Maine at Orono and an M.Ed from Boston College. She is a life-long Episcopalian who enjoys PBS, knitting, Jello, and children. Her favorite songs are from the era of Gershwin, Porter, and Berlin, yet she loves to listen to church organ concerts. She is the Director of Children and Family Ministry at St. Mark's Episcopal Church in San Antonio, Texas.